This review aims to outline the most recent evidence on the efficacy and effectiveness of mentalization-based treatment (MBT) for personality disorders (PD) from 2015 to 2018 and to describe new treatment developments. Since 2015, 14 new—primarily effectiveness—MBT trials have been published. The main body of studies investigated adult populations (n = 11), patients with a borderline personality disorder (BPD) diagnosis (n = 8), and compared MBT with another psychotherapeutic treatment (n = 6). The majority of studies suggest that MBT has the potential to improve the clinical outcomes for adolescents and adults with a PD diagnosis, particularly BPD, and also with comorbid diagnoses and there are indications for changes in mentalizing being a specific mechanism of change promoted by MBT. Despite promising findings, there is an urgent need for methodological sound and sufficiently powered studies to investigate both the efficacy and effectiveness of MBT, especially beyond BPD. Jana Volkert, Sophie Hauschild, and Svenja Taubner declare no conflict of interest. 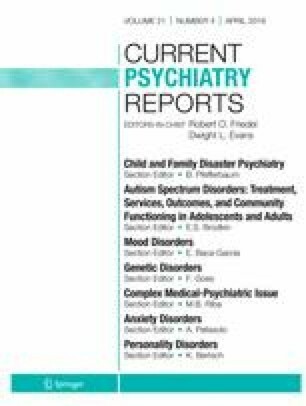 Volkert J, Gablonski T-C, Rabung S. Prevalence of personality disorders in the general adult population in Western countries: systematic review and meta-analysis. Br J Psychiatry [Internet]. (2018 Sep 28) [cited 2018 Nov 1];1–7. Available from: https://www.cambridge.org/core/product/identifier/S0007125018002027/type/journal_article. Fonagy P, Luyten P. A developmental, mentalization-based approach to the understanding and treatment of borderline personality disorder. Dev Psychopathol [Internet]. (2009 Nov 14) [cited 2018 Nov 2];21(04):1355. Available from: http://www.journals.cambridge.org/abstract_S0954579409990198. Hauber K, Boon AE, Vermeiren R. Examining changes in personality disorder and symptomology in an adolescent sample receiving intensive mentalization based treatment: a pilot study. Child Adolesc Psychiatry Ment Health. 2017;1–7. Available from: https://doi.org/10.1186/s13034-017-0197-9.